Great white sharks have long been fodder for horror stories. Travelling on a liveaboard, Danika Porter sets out to determine whether these toothy carnivores live up to their reputation. My face is centimetres from lethal jaws. Only a mesh barrier separates me from the teeth of a great white shark, whose body stretches twice the length of my protective cage. Even a little nudge against the metal enclosure hits with tremendous force. I regain footing and hold my position. Alone, and in patting distance of a killing machine, I should be petrified. Instead, I’m in awe. I’m staying on the Princess II for a four-night Rodney Fox Shark Expedition, cruising around the Neptune Islands – otherwise known as one of the best shark restaurants in the southern hemisphere. The isles, 70 kilometres from Port Lincoln, are also home to Australia's largest fur seal colony. 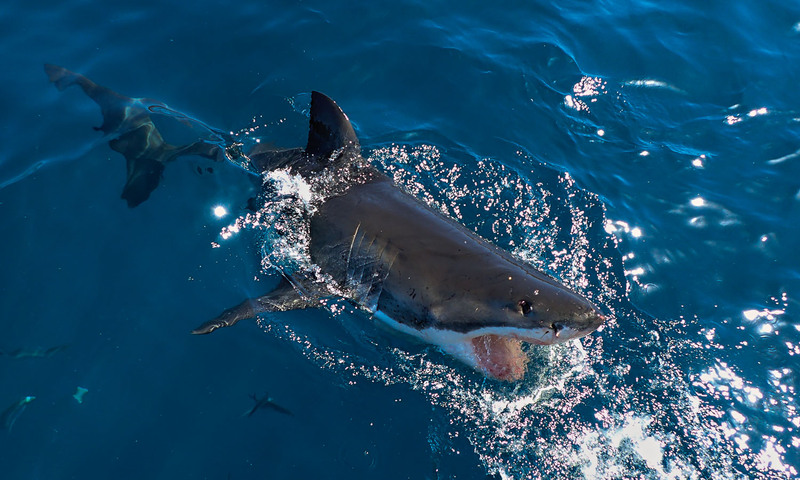 Peak breeding season is over summer, an opportune time for great whites to fill their bellies. From April, seal pups learning to swim make for tasty shark treats. It's a twice yearly smorgasbord locked into a great white’s feeding calendar. The cage protecting me from the shark’s powerful jaws was designed 50 years ago by Australian conservationist Rodney Fox. At the age of 23, Rodney survived a near-fatal shark attack during a spear fishing competition, and the ragged wounds coursing across his chest, right arm and hand had to be sewn closed with almost 500 stitches. The encounter left him with a fear fed by the prevailing ideology of the times – that the best shark is a dead shark. It also imparted a fascination for these creatures that he’s not yet been able to shake. Rodney devised a plan to create a two-man cage that would keep him safe while he attempted to capture the first ever underwater footage of a great white. It worked. But as his 1965 documentary Attacked by a Killer Shark screened around the world and he dedicated more time to observing great whites, Rodney’s perception of these “man eaters” started to shift closer to curiosity. Even so, when Steven Spielberg’s production team came calling with a request for live recordings for their 1975 blockbuster thriller Jaws, Rodney obliged. Realising he had unwittingly helped to turn ravenous great whites into the stuff of urban legend, Rodney set to work debunking myths about sharks. On his mission he created the world’s first shark cage tours to help divers meet them in the flesh. Today his son Andrew continues his advocacy work, taking travellers out to meet great whites on Rodney Fox Shark Expeditions. Over 15 years, Andrew has collated an extensive catalogue, identifying great whites through a renowned identification program that gathers behavioural and biological data, and monitors human impact as well. Rodney Fox Shark Expeditions offers the only liveaboard shark tour in Australia, and it’s the only one in the world to also winch a cage to the ocean floor. PADI-certified divers who opt for this encounter lounge on the sea floor with front-row seats to the shark show. Non-divers like me get first dibs on the surface cage, which hangs in the water and offers speedy entry when the great whites turn up. Actually spotting a shark comes down to luck and the good grace of Mother Nature. Andrew warns that we might have to wait hours, scouring the ocean’s waves for a teasing slice of a fin. Within seconds of the first sighting a wall of cameras materialises and the frantic race to kit up begins. I squeeze into a full-body wetsuit and booties, pull on a painfully tight hood, and finally don my gloves and mask. It’s a laborious process, but essential if you want to withstand the frigid temperatures of the water off Australia’s southern coast. The tours operate with a berley permit allowing them to pique the sharks’ interest with bait. It’s standard practice, but not without controversy, as common belief holds that chumming and cage diving fosters human habituation. Andrew argues that scientific evidence indicates the outcome is quite the opposite; and a morsel of dead tuna makes an insignificant impact on a great white’s intake of teenage pups and vulnerable newborn seals. Time and time again, I witness circling sharks simply ignore the bait that lands in the water, and it’s roped back in unscathed. Laden with a 20-kilogram weight belt, I bite onto the regulator and gingerly step into the cage. Swell surges over the top, rocking it out of sync with the boat. I brace at the bottom and take a few moments to adjust the breathing aid, trying to tap into some inner calm. My senses are on high alert, and every sound seems amplified. The only noise louder than my regulator’s Darth Vader-esque wheeze is the boom of the cage bashing against the boat. It’s a turbulent ride, exacerbated by my buoyant wetsuit. With my feet straining to anchor under the foothold I’m locked in a comical struggle. It’s as though I’m a human teabag being dunked vigorously in the ocean, infusing the waves with my scent, and I’m acutely aware of rogue limbs escaping the safety boundary. I expect sharks to flock in an instant, but for now there’s nothing but water to be seen. I do a double take when a dark mass finally looms into view, growing rapidly in size. With a twisted grin this behemoth swimmer appears more like Bruce – the friendly great white vegetarian from Finding Nemo – than a human-eating machine. It slips past with little recognition or interest in the cage’s contents, propelling forward with what can best be described as a sashay of non-existent hips. I feel as though I’m gliding, too. Instead of the panicked, heart-racing encounter I expected, it’s a calm and magnificent affair. Finned visitors have us scrambling for our cameras. The aluminium provides a surreal sense of security, easing any fear of becoming tonight’s dinner. As hours pass and new visitors swing by, noticeable personalities emerge. Some glide past with nonchalance, others stalk the bait without fail, their lips peeling back and jaws cracking open to reveal a conveyor belt of teeth and fluted gills. One even has me “gooing” and “gaahing” as though it’s an adorable puppy. Cage diving is most commonly experienced on day trips that shuffle through dozens of tourists. But cruising around on the Princess II means we’re free to take our time, and every second I spend underwater fosters a deeper appreciation for these creatures. It’s addictive, and I’ll gladly accept numb extremities and pruning skin if only for one more glimpse. Qantas has multiple flights a day from Adelaide to Port Lincoln. Return trips start from AU$255. Rodney Fox Shark Expeditions runs two-, three- and four-night liveaboard tours throughout the year. You can choose to be a spectator, surface-cage diver or ocean-floor diver. Prices start at AU$1495 per person, including all meals.